Winnipeg is the capital of Manitoba. It’s where we fly to – via Toronto – on our way to undertaking wilderness canoe trips such as the Bloodvein river, which ultimately flows into Lake Winnipeg. Winnipeg tends to be the staging post for our international travel on these trips – we stay a night in Winnipeg when we arrive from overseas and, when we come out of the bush at the end of a trip, we’ll overnight in Winnipeg before heading home the following day. Typically we have overnight flights home, so this means we get to spend a good part of a day in Winnipeg – visiting outdoor stores and the excellent Manitoba Museum. Much of the content of the main displays in the museum link with the trip as a whole. Sections on the geology, geography, ecology, natural history, human history and anthropology all served to illustrate or further inform aspects of the trip we’d just taken. There is also much in the museum about the fur trade, settlers, prospectors and surveyors, farming and the general history of the province of Manitoba. On entering the main section of the museum, you are almost stopped in your tracks by an arrestingly dynamic diorama of a scene from one of the highly organised Métis buffalo hunts that took place during the fur trade era. As you approach the display, it feels like you are about to be trampled underfoot by the fleeing buffalo. 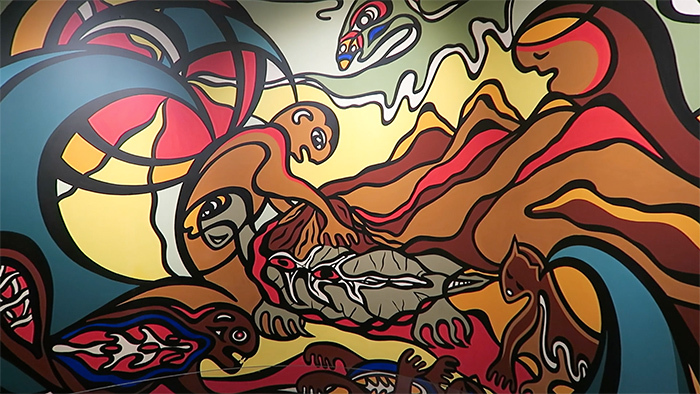 In several parts of the museum, there are displays of eye-catching contemporary Native art. Much of it also reflects the First Nations world view and creation myths, which is born of living close to nature and the philosophies which allowed them to successfully live from the land. What particularly interests me is how the geology and climate of this part of the world forms the various biomes present in the state. I love the boreal forest environment. Travelling for two weeks through printine boreal forest is a real privilege. I’m fascinated by the natural history and human history of these vast north woods. It’s this aspect that I’ve tried to focus on and capture in the following video blog, with some interesting take-aways and insights for those who are interested in this environment and its bushcraft. You can also view this video on YouTube here. This was my second visit to The Manitoba Museum and I enjoyed the visit as much, if not more, than the first visit. If you are ever in Winnipeg, it’s certainly worth dedicating some time to visiting this museum. I would recommend spending the full day there to get the most out of the main galleries. I always learn something from visiting museums such as this. I hope you also learned something from the above video or at least filled in some gaps or joined the dots between different areas of knowledge. It would be great if you could let me know in the comments below what you learned or found interesting in this video blog. Also, what would be your one top take-away that you’d tell someone else? I thoroughly enjoyed this post on Winnipeg and the province of Manitoba. As Winnipeg is my home and the province is my playground, I can attest to the wondrous beauty that this part of the world provides. I haven’t travelled far and wide, but Manitoba holds much of the same amazement that many of my Instagram friends from across the globe showcase on the daily. The lakes, the rock formations, the forests, the plains , the snow and the ice all encompass the spirit of Manitoba, and have injected those of us that are graced with it the vigor and tenacity to live it and love it. Thank you Paul for sharing a part of my world to a part of yours. Wow! What a superb job of giving us some of the highlights of the Manitoba Museum in Winnipeg! You selected interesting exhibits and wove them into a compact and informative overview. I’d visited the museum years ago; but I think I learned more from your present video tour. Just, F.Y.I., should you have a chance to visit Churchill, Manitoba, take the opportunity to visit the local Eskimo (I know it’s not politically correct :)) Museum run by the local Catholic Archdiocese and hosted by Lorraine Brandtson (Spelling?). The museum features both Thule and Inuit artifacts, a stuffed Walrus, a full-sized authentic Inuit Kayak, and hand-made Inuit carvings and arts which are for sale. The museum’s hours are limited; so calling ahead of a visit is prudent. I’m looking forward to your video on your Bloodvein trip. A dream of mine would be to join you sometime! how people used to live in nature and with nature.Today, when you ask a child at the school where it comes milk from , the child says from the supermarket. Many thanks to the new and edifying literature, as well as on video. My granddaughter (eight years) every time with me read and review all of your work, as later and talk. I apologize to my English and grammar mistakes, but I try to learn English well. Thank you for taking time out of your visit to shoot this video to share with those of us who aspire to visit Canada. I am currently reading Cache Lake Country by John J. Rowlands and much of your video resonates with the book. Hope you enjoyed your journey. Best wishes. 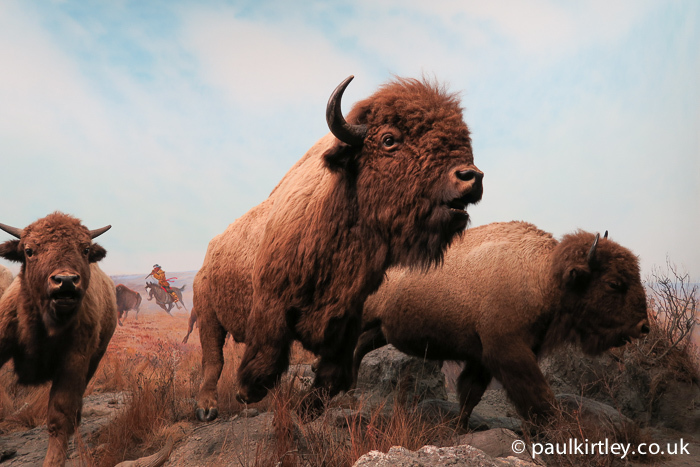 Your picture of the buffalo hunt diorama raised a few memories for me. Even with only one arm – he still carried three 35 mm cameras, (one with b &w film, a second with colour film and a third with colour slide film). Along with a sketch pad and pencils. He could change film in any of his cameras with one had as quickly as I could with two hands. One enjoyable Arctic stop was along the Thelon River – at the ruins of John Hornbys cabin – where we tried to flush out a herd of Muskox for Clarence to photograph for another diorama he was doing for another museum. I managed to get a photo of the tail end of a muskox as he hightailed into the woods. Again, imagine the task. One arm only, loading, aiming and firing. And, the man was the nicest and most humble and thoughtful person you could ever meet. A year later, while he was working in Victoria he invited me to tour behind the scenes at the museum and explain the process. I have long since left bush flying, but my fond memories of Clarence Tillenius remain. And I never miss an opportunity to tell folks what a remarkable person he was. I never did manage to canoe the area..
Hi Paul, thanks for sharing another of your excellent video’s. Although I enjoy all the advantages of living in a modern society , sometimes I feel jealous of the people who lived such a simple, but very hard, form of life. Would have I survived and prospered ? who knows. The way this world of ours is going perhaps we may yet find out. Great stuff Paul! I too love going to museums to research bushcraft, fieldcraft, survival, etc. Great stuff—well done blog entry! The Hilton? I’m definitely coming on one of these amazing trips (obviously the Hilton would not be my preferred sleeping place). I really enjoyed this video. So much history, culture and the origins of the modern world. I think people forget that those simple, long forgotten technologies are the foundations of our modern world. But such is life. There are so many great examples of bushcraft. From bone tools, to cordage , to food stuffs, to skin clothing(stunning) and to the model shelters depicting the use of large birch bark tiles to form roofing. I also liked your explanation of the extreme seasonal changes. History for me is fascinating, is it worth reading David Thompson’s writings? I noticed you had quoted him in the video. He’s on my reading list. Thanks for sharing, shame I cant jump on train to visit the museum. But not a bad excuse to start saving, second to seeing the Canadian wilderness obviously. As an archaeology student, now going into my second year at Southampton Uni, I find museums and their archives fascinating places. Not least because of the amazing artefacts they hold but also the way archaeological and anthropological material is presented and interpreted for the public. It is very interested to see how this is done outside of the UK. What is very clear from watching your video is that an understanding of bushcraft, at whatever level, provides an appreciation and understanding of the manufacture and use of these artefacts and the people who used them. However, in the same way the artefacts can also inform and develop our understanding of bushcraft, such as the way different materials can be utilised. As someone with an interest in flint knapping, more than just being able to appreciate worked stone debitage or tools you can better understand the people who made them; their manufacturing process and the difficulties they may have encountered. I would be interested to see some images of any stone artefacts they had displayed in the museum. That was a great video of and about the Manitoba museum. I really hope I can visit it myself one day. I’m really looking forward to watching the video of your canoe trip and I’m also very envious! But thanks to your sharing I can be a little bit there…. many thans for sharing your Manitoba museum visit. I found everythings intersting from beaver fur gloves to algonquin campsite, but, above all I liked hunting and trapping tools as fishing equipment. I’m always been fascinated on North America native people life, because in my opinion they had the right sense to live, making their life simple and effective. So thank you very much for that. Note how nothing was wasted; using the antlers as a sled brake, or the feet of eider ducks for a sewing pouch. In my mind, such is bushcraft: the exercise of using nature to its fullest and implementing all that is around us in nature for our every day existence. Just love this vid Paul,reminds me of the museum in Toronto called the ROM.I just love the care and attention that has put into every tool and piece of clothing that was made.As for the canoes ,I was taken aback on how neat every stitch was placed.As you can imagine I had to be dragged out of the ROM museum that day.Thanks for sharing the vid.